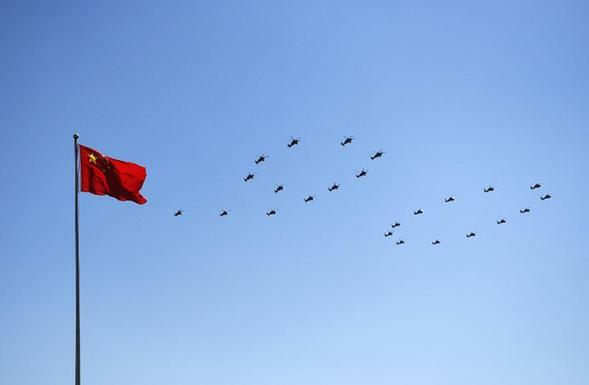 Across China, joyous celebrations took place to commemorate the 90th anniversary of the People’s Liberation Army. The U.S. media’s coverage of these celebrations was predictable. The photos emphasized that China is displaying “military strength.” Some reports even hinted to the U.S. public that somehow these weapons were amassed, and these gatherings had taken place in order to threaten the United States. A great deal of the media’s focus has been photographs of Chinese President Xi Jinping standing before military gatherings. With these images, the Western media subtly insinuates that Xi Jinping is a “dictator” and links him to figures like Saddam Hussein or Augusto Pinochet in the mind of the American public. This is a misrepresentation. The fact that China has a large military to protect its sovereignty, or that its population takes pride in this as an accomplishment, is nothing new. Military parades frequently occur in China and do not signify a threat of aggression toward anyone. While China’s military strength is massive, the country’s record of military intervention beyond its own mainland is very limited. U.S. media missed the real significance of these 90th anniversary celebrations and what they mean for China and the world. In 1927, the People’s Liberation Army was formed in a moment of desperation. The Chinese Communist Party had worked with Dr. Sun Yat-sen and other Chinese nationalists, and shared much of their vision for creating a strong, independent country. The People’s Liberation Army was formed as a mechanism of self-defense, as Chinese Communists and the labor unions and community organizations aligned with them, faced outright persecution. The People's Liberation Army originated as a small group of fighters. It took 25 years of difficult struggles before the People’s Liberation Army and the Communist Party ultimately created the People’s Republic in 1949. This success can largely be credited to the army’s unique methods. Mao Zedong famously wrote the “The Three Rules of Discipline and Eight Points for Attention” which soldiers were required to memorize. These strict guidelines for the activity of the PLA have been put to music, and specifically address how soldiers interact with people. While previous armies in China’s history had a habit of plundering and stealing from the population, Mao Zedong instructed his troops “Do not take a single needle or piece of thread from the masses.” The Eight Points of Attention also addressed the treatment of captives, and forbid soldiers from even using foul language. The short list of rules specifically mandated that women be treated with respect, and not be subjected to any form of sexual harassment. This is an issue which the U.S. military has failed to adequately address, even 90 years later. Many American writers visited the territories controlled by the PLA during the 1930s and were deeply impressed. Edgar Snow, Agnes Smedley, Anna Louise Strong, among many others, saw something very unique about the PLA’s organizational practices. During the Second World War, Hollywood film-makers were so impressed with the activities of the People’s Liberation Army, known as the Eighth Route Army at the time, that they created a film called “Gung Ho.” The widely viewed Hollywood movie portrayed a group of U.S. Marines who adopt the PLA’s methods in fighting against Japan. What began in the countryside with Communists seeking to protect their lives is today the largest army in the world. While the People’s Liberation Army certainly captured the imagination of the people across the planet during the 1930s and 40s, over the past 90 years, its methods have proven to be more than just romantic, but largely successful. If Western reporters were interested in honestly reporting on the anniversary celebrations, they would have discovered far more than just a bombastic display of force. The People’s Liberation Army, from its origins 90 years ago, to today as it opens a base in the African country of Djbouti, has a unique place in world history, by any objective measure. What began in the countryside with Communists seeking to protect their lives is today the largest army in the world, and the celebrations are a national moment of pride.